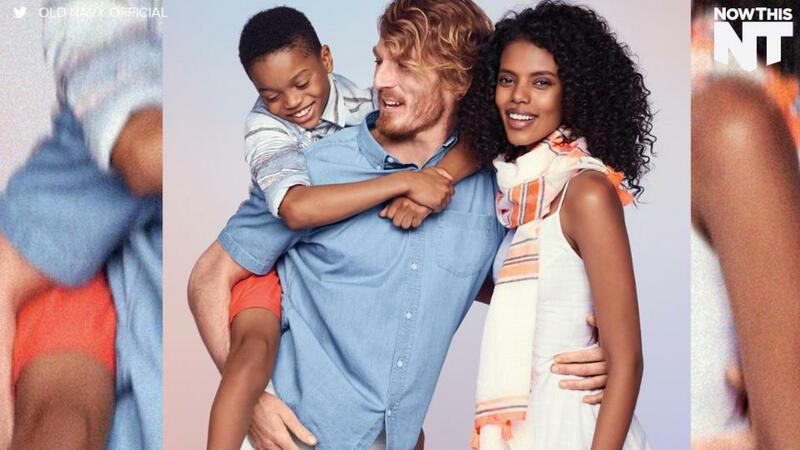 Old Navy was hoping to kick off a happy day of Sunday internet shopping for online consumers when it tweeted an advertisement featuring a smiling interracial family, along with a 30% off coupon. But rather than an immediate boom in sales, the retail giant saw an explosion of racist trolls in their Twitter mentions, lambasting the company for showing what they referred to as miscegenation: the mixing of races. The photo shows a father holding his son and looking at him, while wrapping his arm around his girlfriend or wife. "My family and I will never step into an @OldNavy store again," one Twitter user by the name of @CulturalCombat wrote. "This miscegenation junk is rammed down our throats from every direction." "Where is his father?" wrote @TrumpCoulter16. A quick look at that user's profile, who also goes by the name "FIGHT 4 TRUMP," shows their support of the leading GOP candidates proposal to ban Muslims from entering the United States, along with their profile picture of George Washington wearing a "Make America Great Again" Trump merch hat. 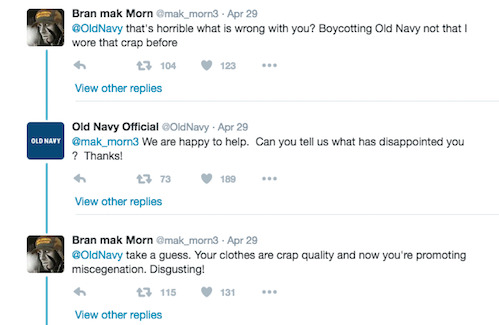 At one point, Old Navy tried to engage with one of the apparently upset users, possibly mistaking their utter racism for genuine concern of a real issue. "@OldNavy that's horrible what is wrong with you? Boycotting Old Navy not that I wore that crap before," the commenter wrote. "We are happy to help," the chain store's Twitter handle replied. "Can you tell us what has disappointed you? Thanks!" "@OldNacy take a guess," the user continued. "Your clothes are crap and now you're promoting miscegenation. Disgusting!" The company has yet to respond to any of the commenters or this user, who continued to spend a large part of his day seemingly very frustrated about the one photo used by Old Navy. He wasn't the only one upset by the inclusive photo, with several users blasting the company in repeated, lengthy rants all boiling down to their belief that mixing races is unconventional and shouldn't occur in society and advertising. @OldNavy Interracial marriages aren't shoved down throats. Why are white couples ALWAYS being advertised? You go, Old Navy. @OldNavy Would it make everyone feel better if they were just a single mom & her transgendered son out & about w/ her GBF (gay best friend)?